Life on Windmill Farm hasn’t been the same since Julia Lapp’s father has had trouble with his heart. But that doesn’t stop Julia from hoping for a bright future. She has planned on marrying Paul Fisher since she was a girl. Now twenty-one, she looks forward to their wedding with giddy anticipation. But when Paul tells her he wants to postpone the wedding - again - she is determined to change his mind. She knows who is to blame for Paul’s sudden reluctance to wed: the Bee Man.Roman Troyer, the Bee Man, travels through the Amish communities of Ohio and Pennsylvania with his hives full of bees, renting them out to farmers in need of pollinators. A mysterious man who relishes his nomadic life, Roman especially enjoys bringing his bees to Stoney Ridge each year. But with Julia seriously at odds with him, Windmill Farm is looking decidedly less appealing. 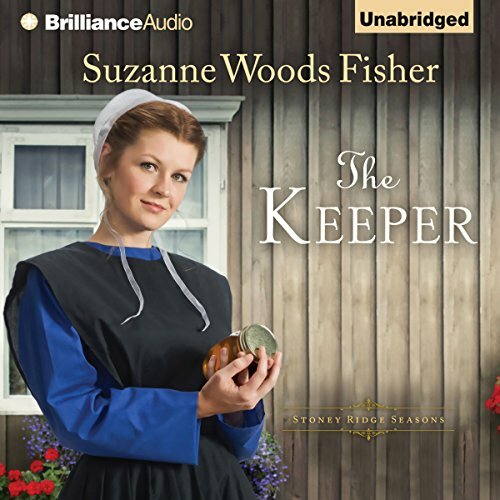 ©2012 Suzanne Woods Fisher (P)2012 Brilliance Audio, Inc.
Paul Fisher is not the guy for Julia Lapp, even if they are promised to one another. She's finally woken up and realized his cold feet might mean something. But she's angry. And she targets Roman Troyer, the Bee Man, as the instigator. Roman is far from home with a streak of white hair announcing the trauma he's experienced because if one looks closely they'll see a handsome young man. Only his past has caught up with him in the form of an irascible woman who is not going to let him keep running, if she can help it. Julia's winsome character and strength make her a strong heroine and her sister is a lot of fun, too. Stoney Ridge is a lovely place but so many changes have happened that the inhabitants of the Lapp farm aren't feeling too secure. God's will is at play. And it may not be what Julia and Roman think it is. Lovely story, great characterization, and that fabulous Suzanne voice--what more could you ask for? Beginning Grates . . . Rest Compensates! Liked the story but too much filler material. The narrator has good voices and does a good performance except for the most serious parts. Her acting was too cavalier for the depth of emotion in the script. love the whole stoney ridge series! the reading was excellent and the story line awesome! Slow start but very good story.